For domestic buyers, orders are shipped through registered post or through domestic courier companies etc. 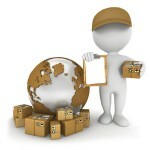 For International buyers, orders are shipped and delivered through registered international courier companies. Quran Wa Hadith is not liable for any delay in delivery by the courier company / postal authorities and only guarantees to hand over the consignment to the courier company or postal authorities. Delivery of all orders will be to registered address of the buyer or shipping address mentioned by them. Quran Wa Hadith is in no way responsible for any damage to the order while in transit to the buyer. Quran Wa Hadith can change the rate of the all the books without any notifications. The rate change can occur because of multiple reasons. When you place an order, we will estimate shipping and delivery dates for you based on the availability of your items and the shipping options you choose. Please also note that the shipping rates for many items we sell are weight-based. To reflect the policies of the shipping companies we use, all weights will be rounded up to the next full Kgs.